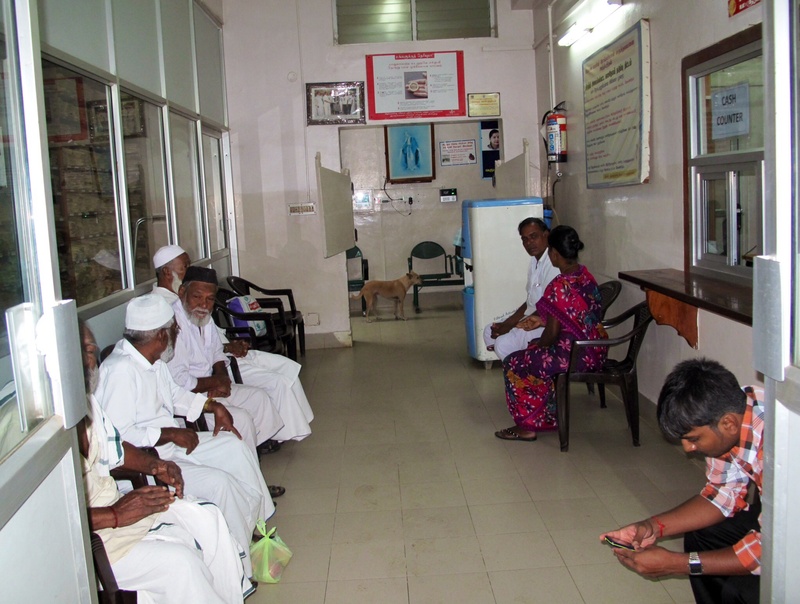 Welcome to the registration and Entry area of Rangamal Hospital. This morning it was my pleasure to visit Rangamal after many years; I found the atmosphere as warm, the staff as pleasant and helpful as ever. With Mother Theresa and Ida Scudder in mind we can all be thankful to Sylvia Wright, who established and sustains this hospital with her tireless dedication. Sylvia embodies the English respectful affection for other beings, sentient and otherwise. It’s the very best national characteristic of all. 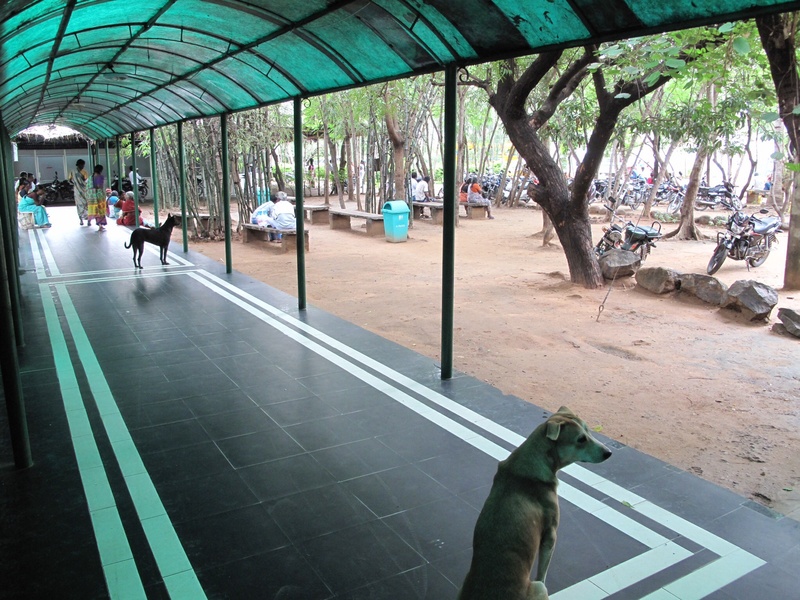 Companionable dogs stationed beneath waiting-room benches is not a familiar sight where I come from – the notion would be an outrage in a so-called civilised country, but that’s their problem. 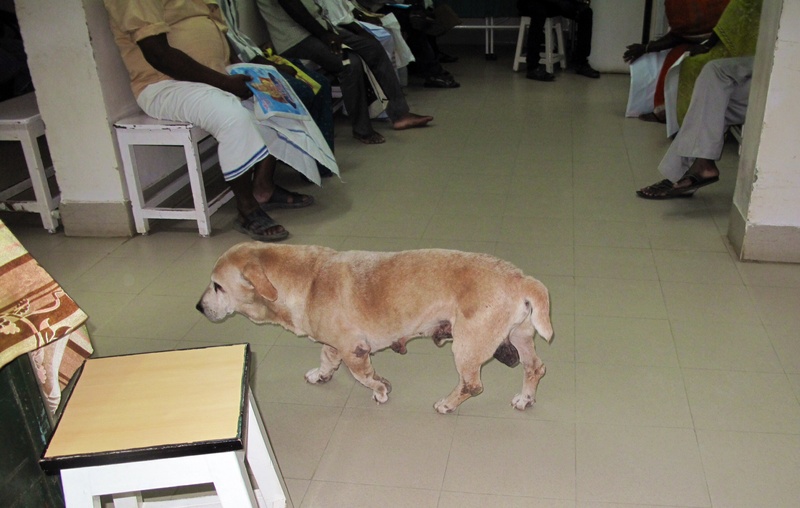 However it never fails to impress me to see the Rangamal doggies because dogs love hospitals and are effective as healers as we all should know. Nurses and doctors here tell me that some local patients have fear of dogs – and in a country where rabies turns up, that is understandable nevertheless it’s counter-productive: It makes dogs feel uncomfortable and suspicious to be feared for no good reason that they know of, wherever you are, hence they are far more likely to take offence and perhaps bite at the fearful person, which is precisely what is to be avoided at all costs. Puppy is the senior canine member of this establishment; he is easily deterred unfortunately by the Flash function in cameras, so as soon as you point your camera at him – even when seemingly asleep beneath a waiting-bench, he immediately splits in a dignified manner. An unknown Dog stopped and stared in from the gate half an hour ago ago so the scouts are alert to new developments today. 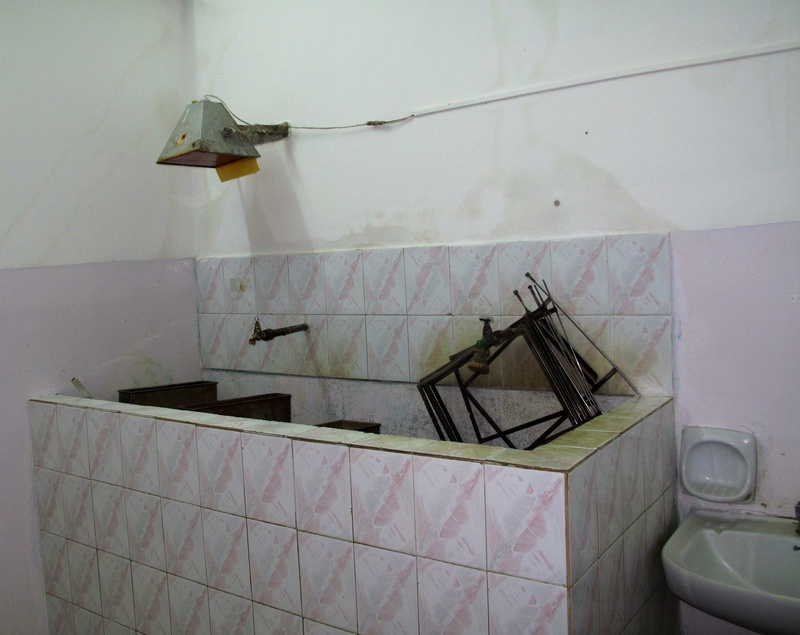 Most of the patients coming to hospital are disempowered people with even less than my familiarity with human bodily functions and they tend to be very poor people although not as poor as those who rely on the government hospital. This hospital provides a tremendously valuable public service to a very large number of community members. Until recently – within thirty to forty years, all women in competent families inherited from their mothers and grandmothers a wealth of traditional herbal knowledge such that most ailments could be satisfactorily treated by the ministrations of family members. During the intervening period this general herbal knowledge has been lost – largely due to the alluring intrusion of FastFood Allopathic solutions which – as will be discussed later, have only minimal hegemonic hold on the Indian mentality. Since this traditional herbal knowledge is largely lost – particularly by poor women, in the absence of ingenuity people are trapped with no known solutions within their vicinity except for stethoscopes. 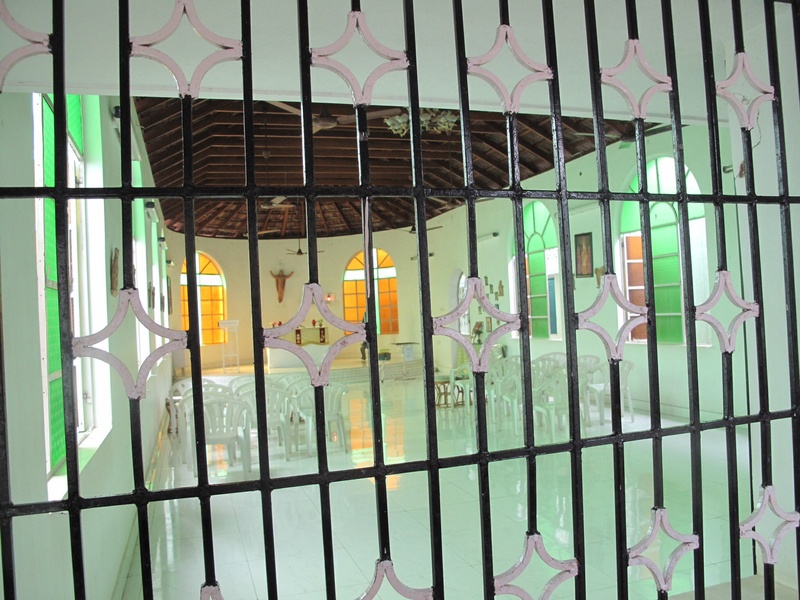 My adopted daughter was dying when she came to live with me and we made frequent journeys for four years to Puducheri for her treatment with a reputed Ayurvedic doctor; that was the best decision at the time although now there are more options for severe medical needs, including – thankfully, Rangamal Hospital, several reliable Homeopathic doctors and pharmacies, an exciting variety of humble doctors clutching great-great-grandfather’s notebooks, prescriptions for ailments and case-studies, also an excellent Muslim Medical shop in the bazaar that sells and advises on the Unani system of medicine, a few reputable Siddha Doctors including one famous doctor with his own hospital in Chennai who visits his local clinic here twice a month. 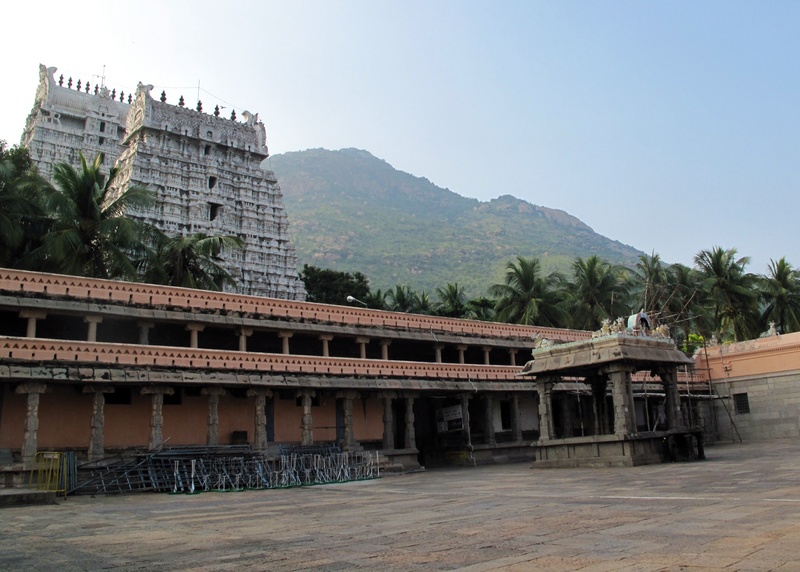 Tiruvannamalai was a renowned Centre for Siddha medicine from ancient times; very near to Ramalingam’s local clinic in the Sri Arunachalaeswara Temple complex at the back of the sanctum sanatorium, lies the samadhi of one of the famous original Siddha saints Sri Arunagirinathar . . . .
. . . . . and in the Gosala is a Lingam in a small cave dedicated to another Siddha Saint Idaikadar. However by the mid-eighties injections had become the panacea for physical problems among the uneducated in the community. I found it particularly alarming that the Tamil word for medicine was also the most commonly used word for poison. Antibiotics soared to the absolute heights of medical currency since FastFood sells. But when my daughter was little two young friends contacted polio – handicapped greatly for life, three friends died of Hepatitis and one of Meningitis – to spotlight just a few freakish aspects of life at that time. When you step up into a medical arena from impoverished platforms you need to wear your discomfort and pain: it belongs to you, you require urgent attention and your pain at that point is a valuable possession: you own your own pain and it is important. Dogs can read these signs of distress; they offer sympathy, they are our best friends remember even to people who haven’t a clue how to communicate with them or empathise with them when they in turn are in bad shape. So today as I sat on waiting benches I watched a large number of poor confused sick people with their pain and apprehension written all over their forms, accompanied by their sympathetic carers. 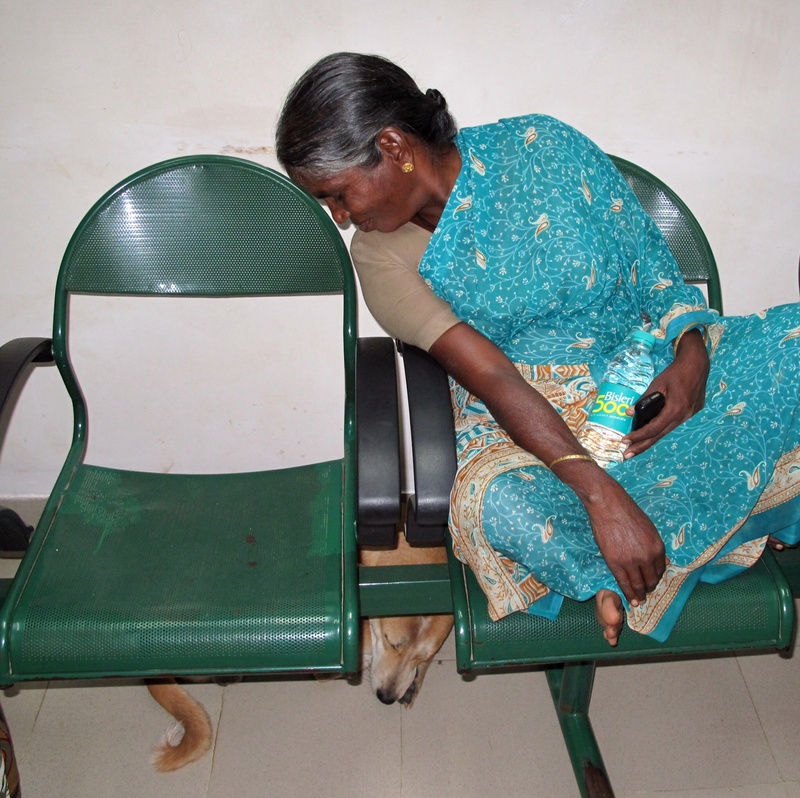 Here I should mention that in Indian hospitals a family member must accompany a patient, even stay in the ward with them after admission, sleeping under the bed and trying not to intrude on routines. 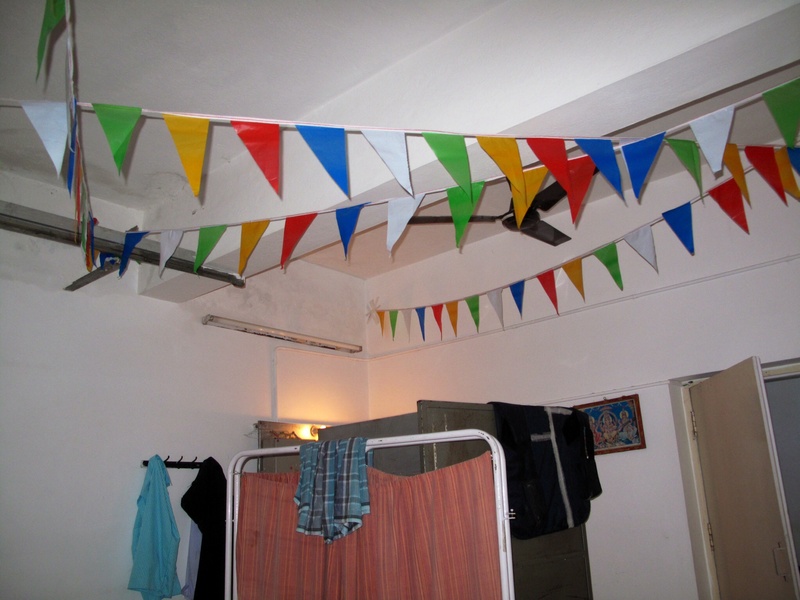 This makes Indian hospital wards very homey. As do the dogs. As you can see, this whole hospital is very homey. The staff are cheerfully focussed and certainly seem to love their job beyond the call of duty. And many have worked here for a very long time. One particular male security attendant is responsible for order in the tiny space allocated for all admissions (where a carefully competent, sweet nurse takes everybody’s basic blood-pressure, weight, pulse and so on, all recorded with biographic details; this has to happen for all patients before seeing a doctor). This attendant has masterfully maintained decorum, soothed anxiety, clarified confusions, shared jokes, pushed hundreds of thousands of wheelchairs, pacified panic attacks, blown whistles when absolutely necessary, directed the lost and handed out information to anyone with unspoken questions as well as tidbits to the dogs for more than twenty-three years, with pleasure. I need also mention that this small cramped always over-populated space that is his arena also houses two small consulting rooms for General Practitioners and one for specialists, The Injection Room – a very popular venue and the Ultra-sound room, with the benches appropriate to each queue for each door nicely providing beneath them those contented grounding domains that frequently emit canine snores. 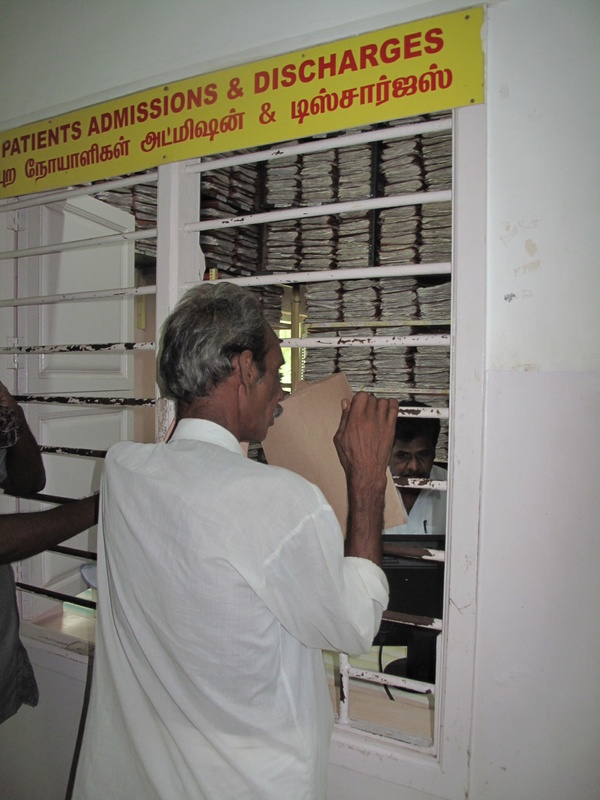 Because of KaliYuga’s global economic imbalance and India’s most crippling social disease – corruption, our medical technology here is a little old-fashioned; however patients here receive the treatments they require, the technology provides the information needed for doctors to find solutions to problems. Technological advancement beyond what’s available in excellent hospitals like this in small towns can be sought if needed in sophisticated institutions in cities. The technicians who work with slightly outdated technology are thankful for the equipment they have and so are the patients. 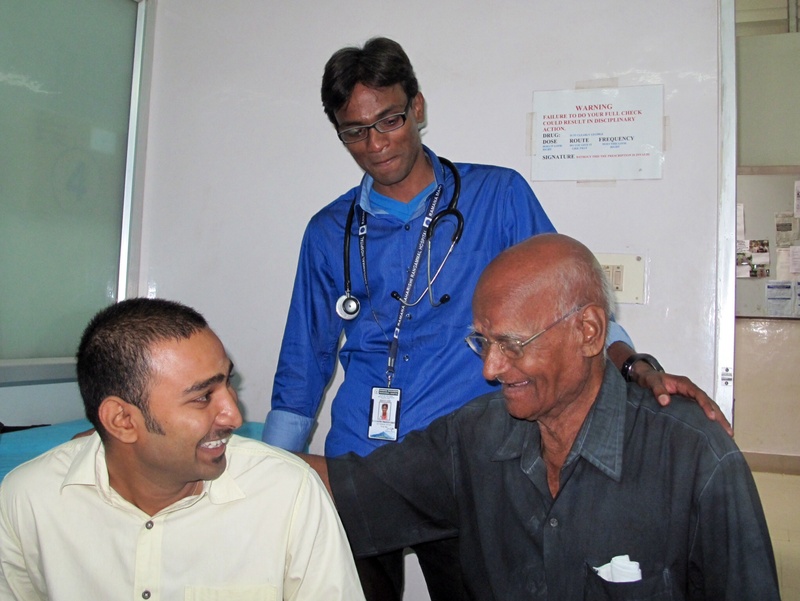 Two excellent doctors share confidence in life with a contented elderly patient like me. Long ago here most babies were born at home; I have written on this subject elsewhere, but that’s another story. Even though local herbal knowledge has deteriorated tremendously in recent decades, Allopathic medicine has no chance of establishing a monopoly here as it has in Australia, Europe and the US, because local people retain a profound respect for the curative properties of plants. Annamalai hillock is renowned for its healing capacity in the protuberance itself and in the plants nurtured on the slopes. There is also in the heart of the average local cognisance of the plurality of perceptions and practices in human understanding particularly in this curative field. There are many and various distinguished medical systems and no one of them takes triumphant precedent over the rest. In the so-called West, one of the recognisably advanced aspects of KaliYuga in the meagre prism of the present stage is the revival of respect for indigenous knowledge especially in this domain, while in India generally and here in particular this respect has never dwindled let alone died. Knowledge of the medicinal properties of plants is built in to the South Indian culinary tradition according to season as well as digestive function on a daily basis. Specific plants are to be avoided in summer and served in winter, in response to fever, excess mucous, digestive dysfunction, headache, period pain and so on; it is common knowledge which plants are heating and which cooling; which arousing, stimulating, which calming, composing. Herbal remedies for human and animal maladies function in co-operation with natural processes, they demand some adjustment in the lifestyle of the patient and they require patience or in another word: time.